Xiuzhen (修真) is the principal technique in the Taoist quest for immortality or spiritual transcendence, a theme documented in Chinese history since the legendary Yellow Emperor 2697-2598 B.C.E.). Xiuzhen means “to practice and learn the way of the truth.” Xiuzhen combines alternative biology, ontology, and teleology from the perspective of Taoism. Xiuzhen must be practiced in tandem with Xiushen, which is a betterment of one’s conduct based on the principal teachings of Taoism and Confucianism, including the concept of De (inherent character; inner power; integrity). The practice of Xiuzhen leads to the attainment of spiritual immortality, in which purified souls return to their original state as Yuanling (原靈, primordial souls). On another level Xuizhen extends the biological lifespan of the living, giving more opportunity for a mortal to accumulate merit and wisdom. Certain aspects of Xiushen, such as veneration of parents and elders well after their deaths, an idealized standard of human conduct, and concepts like De and Deeds, have become part of Chinese culture and thought. Western scholars have encountered difficulty in treating Xiuzhen as a serious subject of study, because it does not fit into any current scientifically acceptable or biologically sound model. Xiuzhen is often mythologized along with the immortalization techniques practiced by Fangshi, chosen mortals who were said to be endowed by the Daoist deities with specific supernatural skills. The term “Xuizhen” is derived from the Xiuzhen Tu (修真圖; Chart of the Cultivation of Perfection,), an as yet undatable map of the human anatomy explained in the context of Xiuzhen. The Xiuzhen Tu is thought to be as old as the Neijing Tu (內經圖, Chart of Inner Warp) attributable to the author of Huangdi Neijing; both are traceable to the thirteenth century Xiuzhen shishu (修真十書, Ten Works on Cultivating Perfection; DZ 263). There is no consensus on the exact dating of either chart but Taoists believe they could be as old as the Huangdi Neijing itself. Both the Xiuzhen Tu and the Neijing Tu were attempts to illustrate crucial aspects of Jing Qi Shen in terms of the human anatomy, identifying the Jing mai (circulatory system), the pressure points, and various stages of Neidan attainment. Xiuzhen combines alternative biology, ontology and teleology from the perspective of Taoism, and establishes complex relations among the precepts of yin and yang, wu xing (five elements), bagua(eight trigrams), I ching, Jing Qi Shen, Jing mai(circulatory system), Shen Xin Yi (internal alchemy) and karma or causality. Xiuzhen must be practiced in tandem with Xiushen, which is a betterment of one’s conduct based on the principal teachings of Taoism and Confucianism including the concept of De (inherent character; inner power; integrity). 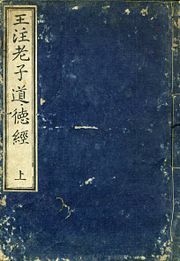 Tao Te Ching, Wang Bi edition, Japan 1770. One of the earliest recorded emperors, Qin Shi Huang (259 B.C.E.-210 B.C.E.) is said to have misguidedly sent fleets of virgins to seek knowledge of eternal youth. Since the days of the legendary Yellow Emperor, orthodox Taoism has prescribed the practice of Xiuzhen as a means of harmonizing with dao and purifying the Jing Qi Shen (精氣神). Jing Qi Shen refers to the processes noted in the human body, said to be related to spiritual and physical health. Jing (精) means an essence, qi (氣) breath energy, and shen (神), a divine or human spirit. The importance of the quest for immortality in Taoism is supported by many scholars. Taoist practitioners do not claim exclusivity in this quest for immortality, believing that the meditation and physical discipline practiced by Buddhism and other schools of thought produce the same result as Xiuzhen: Souls eventually become purified or become one of the enlightened Sheng Fok Xian Zhen. Orthodox Taoism has tolerated the existence of a myriad of branches and offshoots such as those recorded in Daozang, all claiming legitimacy. True to the Tao Te Ching, historically authentic practitioners and temples did not attempt to discredit these offshoots in the name of organized religion, or compete with them for power or numbers of adherents. Xiuzhen is ultimately a self-realization, to be recognized and achieved by each individual. the Chinese character 道 dao in Taoism. Although Western scholars have given lip service to Xuizhen, calling it Hsien-Taoism, or “the search for immortality,” it has been treated primarily as mysticism or superstition and not as a serious subject of study. Xiuzhen does not yet fit into any current scientifically acceptable or biologically sound model. In their attempts to understand and explain Taoism, scholars often apply their own methodical and analytical classifications to Taoist concepts and practices, with the result that the actual significance of the concepts is misconstrued. Many specific terms in Taoist teachings take on multiple expressions: The term Tao can be Wuji, Hunyuan Yiqi, mother of all beings, and so on; Jing Qi Shen can be Sanqing, Sanyuan, Sanbao. Some early twentieth century scholars classified Taoism into Philosophical or Folk-religions (Daojiao and Daojia). in order to better understand Taoist concepts by applying a scientific methodology. The concept of Jiao or religion (教) is alien to Chinese thought and these words do not appear in any classical Chinese literature or in the Daozang. In Tao Te Ching, Laozi described Taoism as the Door to Dao, or Daomen (道門), sometimes as Daozhong (道宗). Taoism is the school of Dao (Daojia), and Taoist adherents historically never viewed themselves as belonging to a religion. Mythologized along with Xiuzhen were immortalization techniques associated with waidan, practiced by Fangshi, chosen mortals who were endowed by the deities with specific supernatural skills called the Tiangang 36 methods (天罡三十六法, “thirty-six methods to manipulate the Heaven and the environment”) , or the Disha 72 ways (地煞七十二術, “seventy-two ways to manipulate the Earth and surroundings”), that enabled them to summon and command the spiritual realms. Fulu (符籙) were mythical Daoist practitioners who could draw or write supernatural talismans, fu (符) or shenfu (神符) which they believed functioned as summons or instructions to deities and spirits, as tools of exorcism, or as medicinal potions for ailments. A Taoist manual, Tiantang Yiuji (天堂遊記), explains some of these extraordinary skills in detail, including alchemical processes to turn stone into gold, traditional Chinese medicine and superhuman feats that no longer exist. Scholars sometimes confuse these mystical practices with the concept of Xiuzhen, and regard it as a form of superstition or shamanism. On one level, the nature of Taoist immortality is a spiritual immortality, in which, after attainment, purified souls return to the original state as Yuanling (原靈) or “yuanren” (原人), one of the 9.6 billion original beings from the Mu Gong and Jing Mu in the Chinese creation myth. The second level is a mythical eternal youth or extended lifespan for the living. Laozi is said to have lived more than 996 years in his last of thirteen incarnates as Laozi, the author of the Tao Te Ching; the Three Sovereigns and Five Emperors all lived to biologically improbable ages. In Taoism a parallel objective during the lifespan of a mortal is to attain a state of Xiu Qi Zhi Ping (修齊治平) by following Xiushen Qijia Zhiguo Pingtianxia (修身齊家治國平天下), a set of progressively more noble tasks performed to better self and family and eventually qualify a person to reign over a country and contribute to world peace. This is the ultimate goal of human life for all Taoist adherents, parallel to striving for spiritual immortality through Xiuzhen. This set of objectives was set forth by Confucius in the Lichi. Taoists believe that life does not end at physical death. Depending on the deeds and "de" (功德, “inherent character, inner power, integrity”) that mortals have accrued during their life-times, their souls are subject to a system of rewards and punishments (賞善罰惡) which is applied at death or at Souyuan, the Chinese equivalent of Judgment Day. There exist 33 degrees of heaven for the enlightened or transcended, ten prisons and 153 wards or jails in hell for the incarcerated, and reincarnation in different forms for those neither pure enough to ascend nor sinful enough to merit damnation. The spiritual remains of mortals reside in one of these realms after death. Ancestor worship or veneration has been widely practiced by the Chinese throughout history from the Taoist perspective in which the deceased are not regarded as dead, but as merely having passed from a physical reality on to a spiritual realm. Veneration of parents and elders continues well after their departure, as part of the filial piety accorded to them. Certain aspects of Xiushen, such as the human conduct idealized by concepts like De and Deeds, have been passed down and become part of Chinese culture and thought. Within the theology of Daoism, all humans were originally primordial souls called yuanling ("original spirits") created out of Taiji and Tao. All Yuanling should therefore seek to return to the original realm, to Taiji and to Dao. All adherents to Daoism are expected to practice and conduct their mortal lives by way of Xiuzhen (practice of the truth) and Xiushen (betterment of the self), as a preparation for spiritual transcendence in this life and in the hereafter. Many latter day Sift Text (sieve divination) dictations expressed this concept as Attaining One or Attaining Unity (得一), or as Preserving Unity (Souyi). Everything in existence in all three realms (三曹) changes and is subject to change, except for the this One or Unity (一), which is the spiritual oneness of ling (靈). At a secular level, Xiuzhen is an effort to become a Sheng Fok Xian Zhen, or saint. It is also an attempt to conserve and coalesce the body's energy in Jing Qi Shen to the level at which it existed before birth, in the embryonic state, a process known as reversing life (逆生). Physical life is regarded only as a vehicle or a temporal state for any yuanling, one in which the soul continues to muddy its purity, until the mortal shell finally realizes the need to reverse the process and redeem itself. A mortal who dies without attaining transcendence and admission to heaven will be subject to endless cycles of reincarnation. Xiuzhen is a process that prolongs the physical lifespan on earth until spiritual immortality is finally achieved. According to the heavenly merit system loosely called the Jade Principles Golden Script (玉律金篇), in order to achieve immortality a person must accomplish a minimum standard of Three Thousand Deeds and Eight Hundred De (三千功八百德). Three Roles and Five Humanities (三綱五常) The Three Roles refers to a King being the role-model for his Minister, a Father the role-model for his Son, and a Husband the role-model for his Wife (君為臣綱，父為子綱，夫為妻綱); Five Humanities refers to Benevolence (仁), Honor (義),Code/Courtesy (禮), Wisdom (智) and Trust (信), which together establish the cornerstones of human relationships. Five Tenets and Eight De (五倫八德): Five Tenets refers to the relationships between Father and son, King and minister, husband and wife, among siblings in a family and between friends (父子有親、君臣有義、夫婦有別、長幼有序、朋友有信). Eight De (八德) are Filial Piety (孝), Sibling Piety (悌), Loyalty (忠), Trust (信), Conduct (禮), Honor (義), Integrity (廉) and Humility (恥). ↑ Fabrizio Pregadio, The Encyclopedia of Taoism (Routledge, 2008), 767. ↑ Livia Kohn, Daoism Handbook (Leiden: Brill, 2000), 487. ↑ 3.0 3.1 Jane Huang, The Primordial Breath, Vol. 1 (Original Books, Inc, 1987, ISBN 0944558003). ↑ Isabelle Robinet, Taoism: Growth of a Religion (Stanford: Stanford University Press, 1997), 4. ↑ Jeaneane Fowler, An Introduction To The Philosophy And Religion Of Taoism: Pathways To Immortality (Brighton: Sussex Academic Press, 2005), 4. Creel, Herrlee G. What Is Taoism? : and Other Studies in Chinese Cultural History. Chicago, IL: University of Chicago Press, 1982. ISBN 0226120473. Fowler, Jeaneane. An Introduction To The Philosophy And Religion Of Taoism: Pathways To Immortality. Brighton: Sussex Academic Press, 2005. ISBN 1845190858. Huang,Jane. The Primordial Breath, Vol. 1. Original Books, Inc, 1987. ISBN 0944558003. Kohn, Livia. Daoism Handbook (Handbook of Oriental Studies/Handbuch der Orientalisk—Part 4: China, 14). Boston, MA: Brill Academic Publishers, 2000. ISBN 9004112081. Maspero, Henri. Taoism and Chinese Religion. Amherst, MA: University of Massachusetts Press, 1981. ISBN 0870233084. Pregadio, Fabrizio. The Encyclopedia of Taoism. Routledge, 2008. ISBN 0700712003. Robinet, Isabelle. Taoism: Growth of a Religion. Stanford, CA: Stanford University Press, 1997. ISBN 0804728399. This page was last modified on 1 August 2013, at 14:07.